Hamish’s report: I came into this race feeling pretty good. It was to be my first ever attempt at defending a title. I knew I was going to have my work cut out going up against fellow TORQ athlete, Chris Standidge, who won the British Championships the week before. 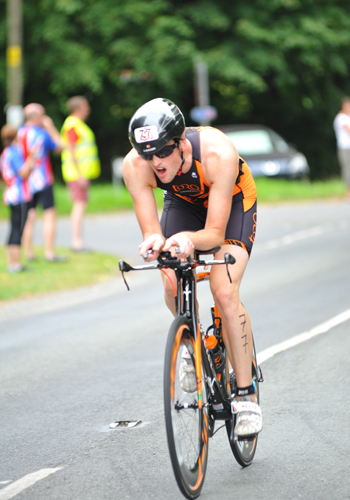 There were also a large number of Great Britain Age Group athletes racing. It was probably the most stacked entry list that this race had ever seen. Nevertheless, I went to give it my best shot. The lake that the swim was in is only a shallow lake and due to the recent spate of hot weather, the water temperature had reached 24 degrees meaning a non-wetsuit swim. The weather was overcast with a slight breeze and not too hot. Perfect conditions really. With the race having a split transition, I set-up T2 first before wheeling my bike over to T1 by the lake. 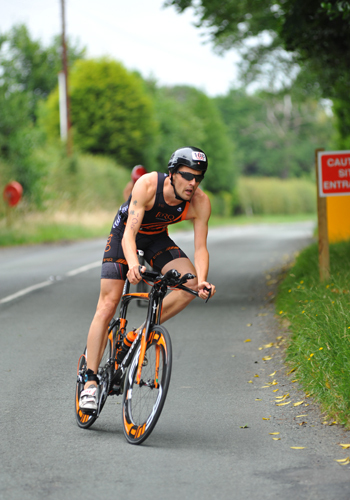 When I got to T1, I realised I had left my swim hat and timing chip in the car. An easy mistake to make. Thankfully, I had plenty of time so I didn’t panic. I set up in T1 then used the jog back to the car as a warm up. I got back to the lake in time for the briefing. 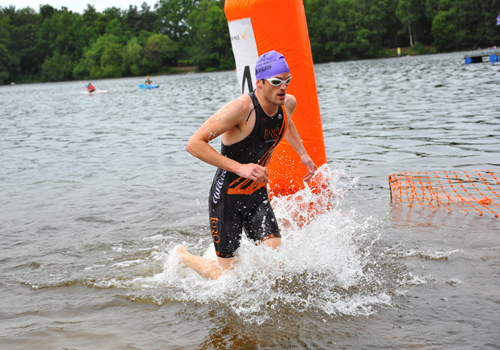 It was soon time to enter the water and swim the short distance to the start. The water was lovely, definitely no need for a wetsuit in those temperatures. When the gun sounded, I immediately got onto someones feet. I saw two swimmers further ahead of the group of four or five that I was in. At the halfway point in the swim, I was feeling strong and upped the stroke rate. I left the group behind and started to claw some distance back to the second swimmer. 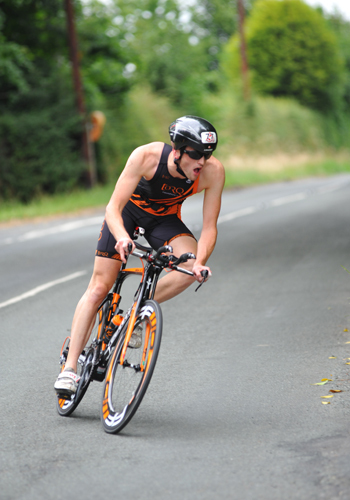 I knew I wanted a gap going into transition as it was very narrow and I didn’t want to get held up. I had a quick transition and exited at the same time as second place. I had a better flying mount than him and overtook him in the process. 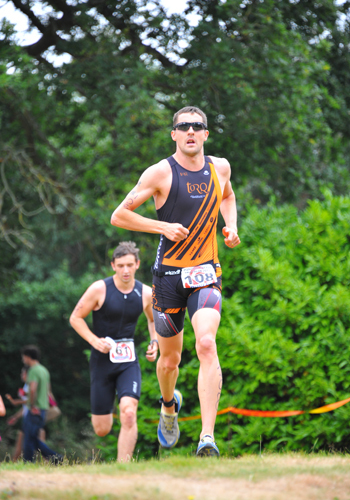 Transitions are definitely the fourth discipline of triathlon. The same athlete went passed me shortly after but I used him as a carrot, 20 metres ahead of me. After a swift T2 I set out on the run. One of the beauties of this course is the first section of the run goes out the way the bikes come in so I could see that I had a comfortable gap behind me and it was highly unlikely that anyone would be able to catch me. Nevertheless, I still ran hard. I was determined to beat last years time, even with a non wetsuit swim. I crossed the line and took 2nd place in my age category (25-29). It was then a nervous wait to see where I would place overall with Chris being in the following wave. I hadn’t defended my title, but I had beaten my time from last year. When the leaders from the following waves came in, I checked my position and I finished 5th overall in a very competitive field. I was pleased with the whole of my race and felt I performed well in all areas for the first time this season. Hopefully that bodes well for upcoming races. Chris’ report: One week after the win at Liverpool, I was back in action racing at the Boundary Breeze Sprint which doubled up as the North West Sprint Championships. Having won by just 6 secs the week before to Alex Lawton, it was going to be another head to head with Alex wanting his revenge! The continued good weather meant that the swim was non wetsuit, and was looking forward to going out hard and taking advantage. Most of the competition was going to be in different waves, from the likes of Alex, Alex Foster and fellow team member Hamish all racing in the 25-29 age group, plus Tony Cullen in the 40-44 age group, so all I could do was time trial to the end and then wait to see how that compared. I took the lead early on in the swim and kept the pressure on as I knew this was where I would be building a lead. The bike course is pretty flat and has 2-3 miles out to a loop that you then do twice to make up the 24k. As I approached the loop part, I could see Hamish in the distance who had started 15 mins ahead, doing his 2nd lap. It gave me a target for the next few miles and although I was closing in it just seemed to be one of those days where the power wasn’t coming easily. I was perhaps tired and mentally spent from the week before, but I guessed Hamish and Alex where feeling the same as they had raced last week as well. Just in front of Hamish was Alex, so I continued the momentum and went past, but I didn’t really make any significant in roads into them. Maybe they both reacted when I went past. There was only a couple of miles before I was going to do my 2nd lap and they would be going to the finish. I kept the effort for the rest of the bike, but my power had definitely dropped in the 2nd half, and I knew that I would need to run well if I was going to win. My run ended up where my bike had left off, not bad, just a bit off the pace, and so I finished in 1:02:49.